Ok, I have a confession to make: I love butterflies. I love the way they look, I love the way the fly and most off all, I love they way they bloom. I’ve always thought the metamorphosis from caterpillar to butterfly is one of the most amazing things nature can offer. We are lucky to live down the road from a lime plant growing neighbor who has a knack of finding young caterpillars in her garden, she was quite happy to hand them over to us so that my boys could watch the amazing process as well. 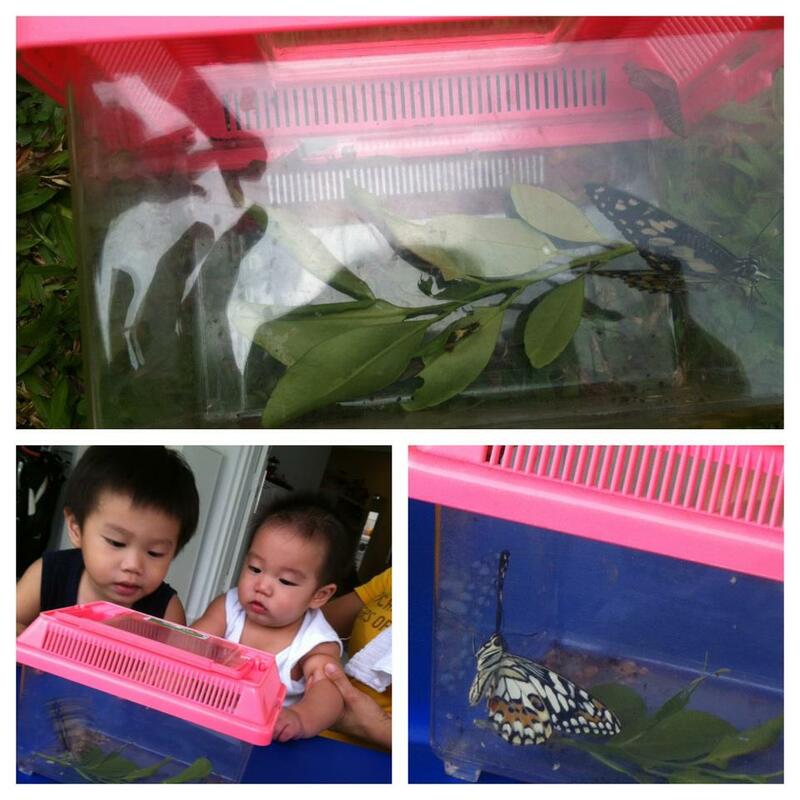 We’ve hatched several butterflies to date and the best part of the whole thing is when we set the butterfly free. So, since it has been a while since our last butterfly blooming project, we went scouting for a caterpillar to rear. She was kind enough to find us three. Our first caterpillar was a real eater of a caterpillar and he worked his way through the leaves quick enough and got really fat fast. Next thing we knew (also, because we were quite distracted those days), he was in chrysalids mode. And in another blink of an eye, he emerged as a beautiful lime butterfly. Before we set the butterfly free, we took the chance to talk about the beauty of the butterfly, what they ate (nectar), how no two butterflies are the same and do some butterfly related crafts: in today’s case, we did butterfly fingerprinting ala Ed Emberley. And as the sun was setting, I took my boys and we said farewell to the butterfly and wished him well. Q was very clear in telling the butterfly that if he needed to find food, he could go ask Mr. Bumble Bee cos they ate the same thing, but to be careful cos the bee might sting. This entry was posted in craft, education, growing things, insects, learning, life cycles and tagged butterfly, caterpillar, chrysalids, garden, insects, life cycle by matchingsocks. Bookmark the permalink.